Upon graduating from San Marcos High School in 1986, Adam Silva attended Barber College receiving his Class A Barbers License from Modern Barber College in Austin, Texas in March of 1987. He then worked a few months in his dad's shop, Silva's Barber Shop, which has been a landmark in Staples, Texas since 1955. Adam opened his own shop, Adam's Barber Shop, in a building which had been the home of Tobias' Barber Shop in San Marcos for many years. A couple of years later Adam moved to a location on South LBJ Street, where he was soon joined by his brother Abel, also a barber. They changed the name to Silva's Barber Shop and later moved to a location on Riverside Drive near Herbert's Grocery and Taco Hut. While at this location, Adam and Able were joined by another of their brothers, also a barber, Sam. The three brothers thrived there until in 2001 they moved into a new building custom built for them on Invasion Street. In 2007, Adam ventured out on his own again and re-established Adams Barber Shop at its current location, 618 South Guadalupe Street Suite 101 in San Marcos, Texas. Adam continues to strive to provide the utmost in customer satisfaction at a fair price. 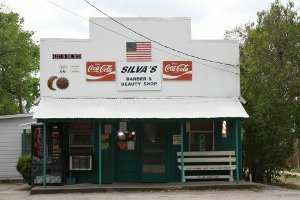 The picture above is of Silva's Barber Shop in Staples, Texas. Adams father currently operates this Barber Shop. 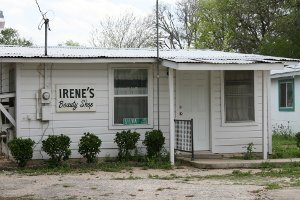 The picture to the right is Adam's mother's business, Irene's Beauty Shop in Staples, Texas.